ScriptCS-GUI has evolved a little bit. At the moment the following helpers are declared inside the static class Gui. Gui.OpenFileDialog(): open a classic Open File Dialog and return the path of the selected file. Gui.PopUp(): open a pop-up and returns a form object. You can use its Sta.Enqueue(action) method to inject code in the form's main thread (e.g. to add controls at runtime) while working inside the console! 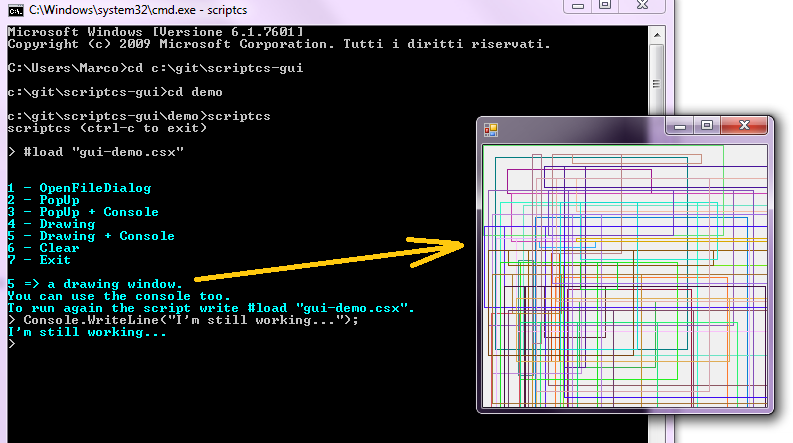 The interactive script "gui-demo.csx" lets you play with classic Windows Forms while the console stays responsive!